Second half substitute Awudu Tahiru scored with the last strike of the game to ensure Medeama SC deny Hearts of Oak a potential victory in a sensational 1-1 draw in Cape Coast on Sunday. Accra Hearts of Oak had began the game brightly and scored through striker Aboubacar Troare in the 37th minute but could not hold on to secure their first victory in 8 games. The home side, Hearts of Oak began the game in an explosive manner and could have fetch the opener in the first minute when Christopher Bonney’s cross was controlled by Joseph Esso, but the forward was crowded by the Medeama defence. 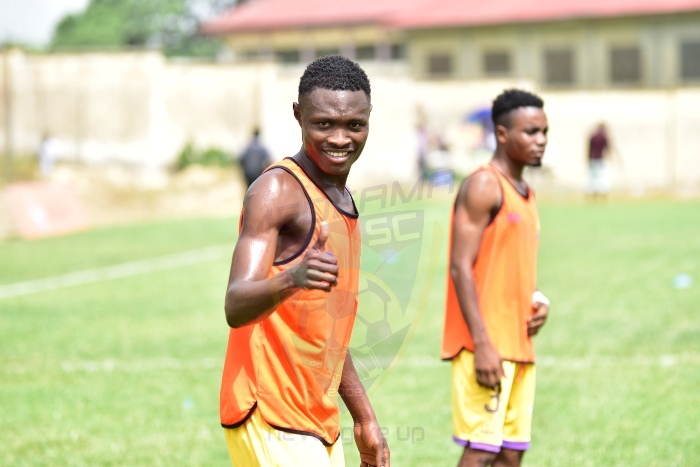 Medeama warmed into the game after Kwasi Donsu and Eric Kwakwa combined in the middle to offer some threat to the Hearts defence. But they were constantly stopped by Camara Nguessen and Winful Cobinna. Meanwhile, as Medeama pushed forward in search of the opener, the Phobians seized the opportunity when the Mauves and Yellows lost the ball to punish them. Winful Cobinna set up Joseph Esso who effort was cleared only to fall for Aboubacar Troare to tap in for the opener. Hearts went in the break with the lead following some period of dominance. With the Rainbow club on a streak of games with a victory, the former Premier League Champions were bent on protecting their lead in the second half. Hearts did not offer a lot in the second department of the game with the Tarkwa Boys taking advantage of the frenetic encounter to pile pressure on the home side. And when the Phobians thought victory has been wrapped up, Awudu Tahiru punished them with a final minute goal to ensure Medeama finished the first round at the summit of the table.